The Bombers Bit BC45 Pelham is set at 45° to follow the contour of the horses tongue. Consequently,a horse who uses his tongue as a means of pushing against the bit and therefore taking control, will draw back and tuck his chin in, coming back to a better point of control. The 75mm shank Pelham has attachments for two reins, one near the mouthpiece and one at the end of the shank. 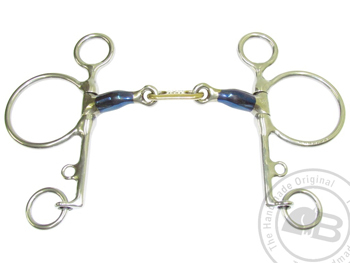 Hence, these reins have similar action to the curb and bradoon reins in the double bridle.